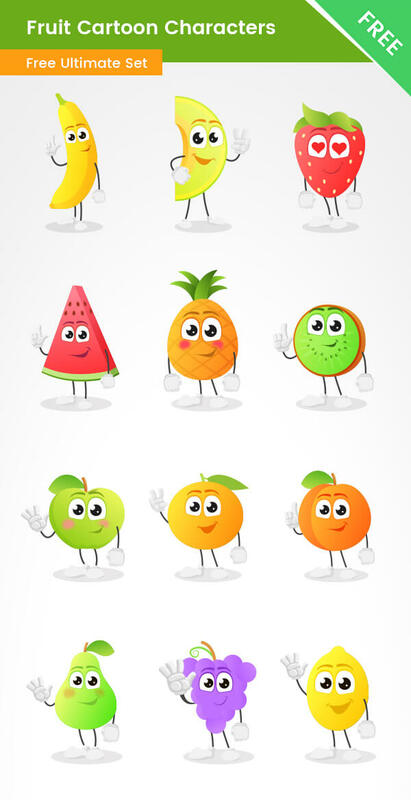 A Huge collection of vector fruit characters. Banana, Strawberry, Lemon, Melon, Watermelon Pineapple, Kiwi, Grape, Apple, Orange, Peach, and Pear made as characters. Available for free download. This huge collection of fruit characters is made of vector shapes, so you can easily import them into your designs without losing quality. They are perfect for kids and school-related designs. All of the fruits are smiling, cute. They will definitely grab the attention of your audience… for free.